The Bhote Koshi River could be the best choice for those who are looking for a short, but fast-paced, rafting adventure in Nepal. 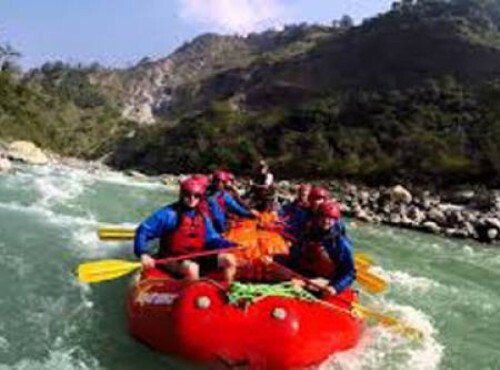 It is the steepest raft able river with technical class III and IV rapids. The trip begins near the Nepal/Tibet (China) Kodari border taking you through the natural beauty of the area. During the adventure, you can take part in other activities such as mountain biking, bungee jumping, and short treks. On this trip, you will get an opportunity to see terraced green fields high above the river on precipitous slopes, as well as curious villagers lining suspension bridges, as you plunge through cascading waves and chutes of foam. A gorgeous three-hour drive gets you to the rafting site from Kathmandu. Technically, the Upper Bhote Koshi ends just after Barbisae where the Sun Koshi joins as a stream from the left. The Lower Bhote Koshi rafting starts from the Lamasangu. Day 01: : Drive from Kathmandu, camp prepared, lunch, run upper section of the river, back to camp for the evening. Day 02: Upper section rerun then downstream to take-out, drive back to Kathmandu arriving pm day 2. All Rafting equipment including life jacket, helmets, paddle, paddle top & self-balling raft.